The Bezier easing demo is now online. It only illustrates ease-out for a few ease types, but it should be enough to get the idea across. 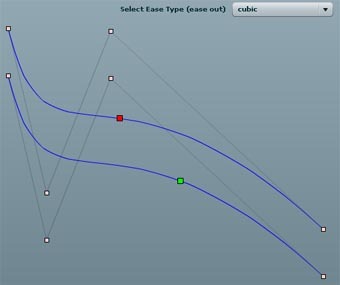 The following screenshot illustrates the difference between natural and arc-length parameterization for a cubic Bezier curve with cubic ease-out. Cubic ease-out for two Bezier curves with different parameterization. 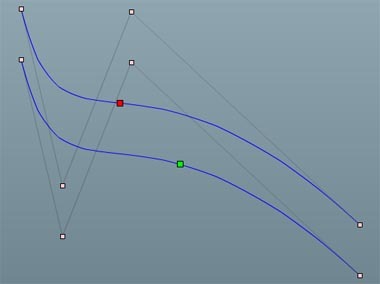 The red marker illustrates application of the ease without arc-length parameterization. The green marker illustrates proper easing with arc-length parameterization. Although motion along the top curve appears to be eased, the motion is incorrect. Worse, the actual velocity along the curve is a function of geometric constraints. The online demo may be viewed here. The page includes a link to download Singularity. The demos folder includes the MXML file for this demo which can be modified to test different easing methods as well as ease-in. I think it’s fair to say that most people apply easing functions as arguments to a method in a tweening library instead of direct application. So, how does one directly apply Penner-style easing functions to path animation along a parametric curve? The previous post in this series illustrated the importance of arc-length parameterization in proper application of easing. Otherwise, velocity along the curve is a function of control-point placement and any application of easing produces incorrect motion. The starting value of the curve’s parameter is zero, so a straightforward easing application uses b = 0 and c = 1. The easing fuction returns a factor in [0,1] that is normally used to map a tweenable parameter such as x, y, or alpha along its range. In path animation, this factor plays the role of the curve’s parameter. where arcLength is the arc-length parameterized cubic Bezier curve and arcLengthMarker is the sprite animated along that curve. The factory variable is a reference to the Singularity easing factory. This allows the user to set the easing type by symbolic name and either return a reference to a class that implements the easing or the specific easing factor. References to specific easing classes are created just-in-time. The online demo should be up tomorrow.